Hollymoor Hospital was built by Birmingham Corporation as a Lunatic Asylum (an out of date term for a psychiatric hospital). In 1900, the contract to build the hospital was awarded by competitive tender to John Bowen & Sons of Birmingham. Part of the contract included a requirement for the building materials to brought to the site by railway. The nearest convenient access point was at the existing sidings at Rubery Station on the G.W.R./Midland Railway joint line from Longbridge to Halesowen. railway and hospital. A parallel but separate line was laid from the sidings and quarry at Rubery for a distance of about 400 yards until the railway reached Frogmill. From here the line ran north-east following close to Tessall Lane for a further 700 yards to the siding at hospital site. A single siding with a run around look was provided at the construction site. A new locomotive was purchased by the contractor for use on the construction of the hospital. The contract was largely complete by the end of 1904 and the locomotive was no longer required. The official opening of the hospital was on 6th May 1905. There are no visible remains of the contractor's railway. The hospital is also closed and most was demolished in 1996. N.B. The hospital was in the City of Birmingham but the branch railway crossed the county boundary into Worcestershire. One of the surviving relics of the former hospital is this water tower. 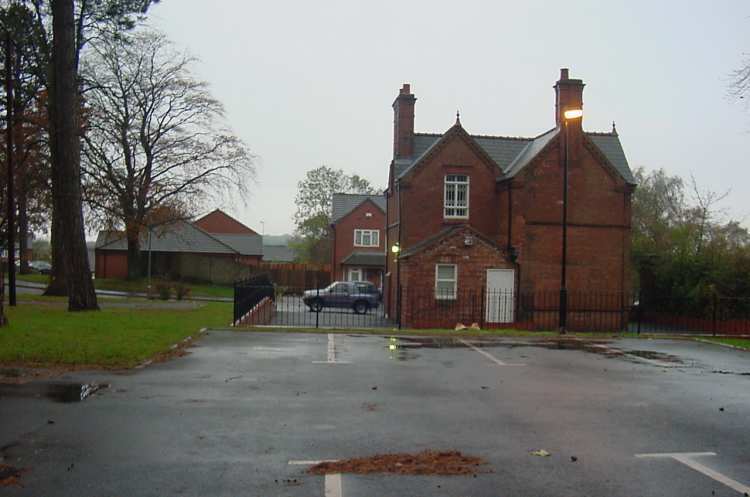 This is Hollymoor Lodge that is situated at the hospital's Tessall Lane entrance. The railway ran alongside the left hand-side of the lodge to terminate in a siding that was at approximately where the photographer is stood. 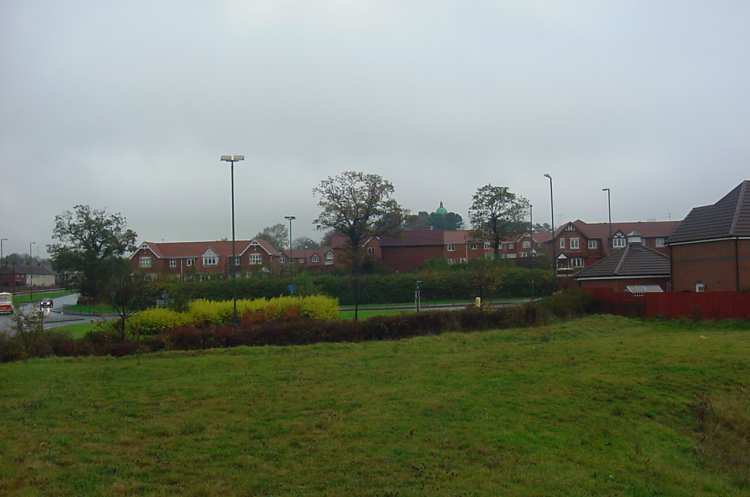 The new houses beyond the lodge are approximately on the old track bed. This photograph is taken from close to the site of the junction with the Halesowen Railway (at the proposed location of Rubery Lane station) but looking towards the hospital. 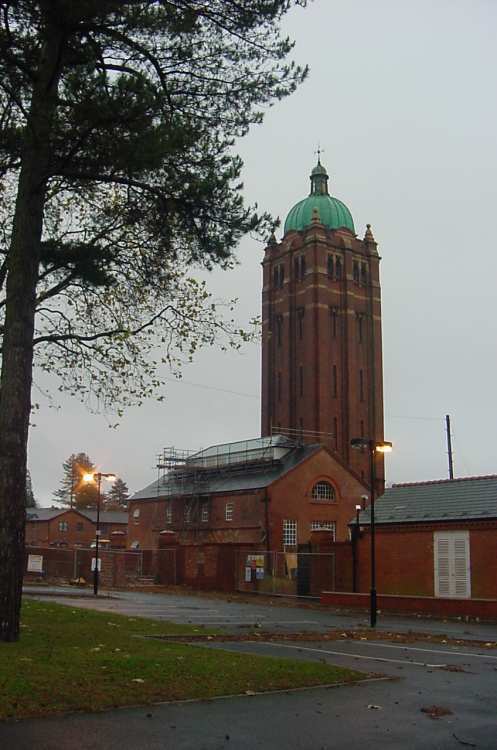 The dome of the hospital water tower is just visible between the trees. Tessall Lane is on the left hand side and the new road in the foreground crosses the trackbed of the Hollymoor line. History of Hollymoor Hospital by Fay Crofts, 1998, published by Brewin Books Ltd (ISBN 1 858581 30 3). This is an extract from the 1904 edition of the Worcestershire County Ordnance Survey map. The survey work for this map was undertaken in 1902. Rubery Station is on the left hand edge of the map and the Hollymoor Hospital construction railway runs alongside the Halesowen Railway as far as Rubery Lane (formerly Bedlams Lane) where it diverges north to the hospital at the point where the proposed Rubery Lane station was to be built.